I honestly have no idea how I'm getting through this week. The Season 6A finale of Pretty Little Liars airs on Tuesday, and it's bringing along every answer to every question we've ever had about the Big A storyline. The show will finally wrap up the mystery that has plagued Spencer, Aria, Hanna and Emily ever since Big A stole the game away from Mona — and will finally tell us exactly what went down on the night that Ali disappeared and Bethany was murdered. While there are approximately a billion questions that Pretty Little Liars fans want answered in the finale, there is one thing at the forefront of every fan's mind — and that is just who the heck is Big A? 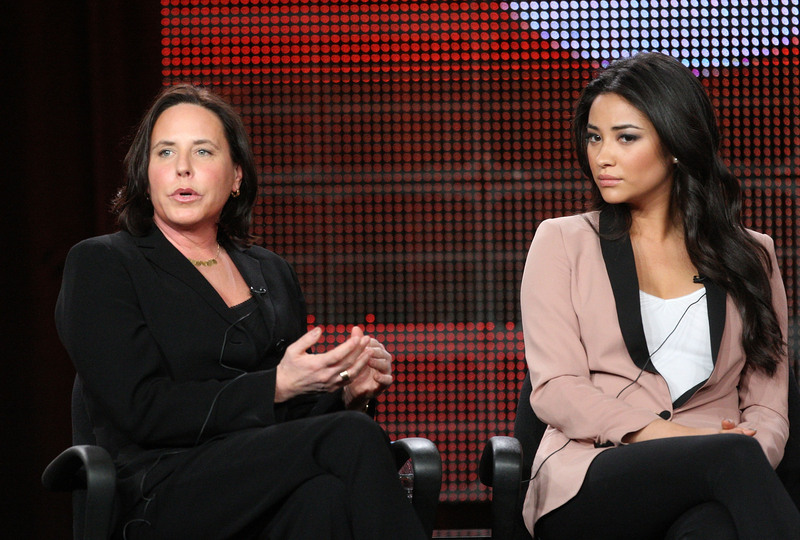 While we don't know who is under A's hoodie, showrunner I. Marlene King and Pretty Little Liars' "Emily" Shay Mitchell are here to show us how we'll act once we find out A's identity. TVGuide sat down with King and Mitchell and asked them to act out how fans would react to the Season 6A finale's ultimate reveal. Luckily for fans, neither of their reactions were heartbreaking disappointment — but heartbreak did seem to be on their faces. Both King and Mitchell acted as though fans would be slightly devastated by the unmasking of A — and that might give us a major hint as to just who the elusive Charles DiLaurentis could be. Unless Wilden has an extremely compelling story for all of us as to why he systematically tortured the girls as a police officer and then again as Charles DiLaurentis, I doubt anyone would have any sympathy for this A reveal. If Wilden is A, that means he came back from the dead to be a jerk. Not exactly something I'd cry over. King promised fans on Twitter that whoever Charles was, he wouldn't be "a random character" — and I'm holding her to that promise. If Rhys is revealed as Charles, our reaction wouldn't be shock or tears: it would be frustration. All of our hearts would be crushed if Toby really was the Big Bad we've been scared of this whole time, but I think our sobs would be much, much stronger than Mitchell and King suggested they would be. I know that I wouldn't leave my bed for the week. My reaction to Aria being A would be to throw my remote at the TV, so yeah, she's probably not A, either. We'll all have to wait just a little longer to find out what our actually reaction is to this Big A reveal — but let's hope it's as mind-blowing as King and Mitchell are making it out to be.